As of May 10, 2015, students must have an FSA ID to access the FAFSA website AND to electronically sign Federal Student Aid documents such as their FAFSA application. Students who are required to provide parental information on the FAFSA will also need to have their parent’s create an FSA ID. Click here to Create An FSA ID and/or to review Frequently Asked Questions. Need help? Watch this short video on How to Create Your FSA ID. Submitting the Free Application for Federal Student Aid (FAFSA) allows you to be considered for federal and state grants, federal and state work study programs, and federal student loans. If you filed a FAFSA last year you will be able to save time by completing a Renewal FAFSA. You must know your FSA ID to file a Renewal FAFSA. The FAFSA asks for financial information found mostly on tax returns. If a parent and/or student has not filed a tax return yet, they can use estimated income from their W-2, last pay stub from December and other end-of-year records. We recommend filing your FAFSA electronically at https://fafsa.ed.gov/. Be sure to add FRC to your application using federal school code (008597), as this is how we receive your application. After you have completed your FAFSA application, a Student Aid Report (SAR) will be emailed to you within 72 hours if you provided an email address. If you did not provide an email address your SAR will be mailed to you within 2 weeks. The SAR will contain all the information you submitted on your FAFSA. Once you receive your SAR be sure to review all of the information for accuracy right away, and make any necessary corrections. Students will need to login to their student portal (MyFRC) and check the Award Status screen which will tell students if there are unsatisfied requirements that need to be completed. There will be forms that need to be printed out and submitted to the office, online authorizations to complete, and if the student has been selected for verification there may be additional documentation that is requested. This documentation may include "Tax Return Transcripts" which can be requested by visiting http://www.irs.gov/Individuals/Get-Transcript. For a complete list of requirements the student can check his or her financial aid status on MyFRC, and the forms can be printed off of the FRC Financial Aid website on the forms page. Students failing to provide the requested documentation WILL NOT be eligible to receive federal assistance. Notice: financial aid verification documents must be received by the institution (FRC) no later than 120 days after the student's last date of enrollment. Once you have submitted all of the required paperwork and completed all of the requirements listed on MyFRC, wait about 1-2 weeks before checking the status of your file. This will give us time to input your paperwork. If there is any additional information that is being requested, or if there is a change to your award, our office will contact the student via email. Click here to check the status of your financial aid file. Students receiving aid will be required to make satisfactory academic progress. Federal regulations require that all students receiving Title IV aid and some state aid must meet or exceed the Satisfactory Academic Progress Policy standards established at this institution. Note: The policy is posted on our website here and is available in the Financial Aid Office. For additional videos about financial aid, please visit Federal Student Aid's YouTube channel. Thinking of attending college but, not sure how much aid you may be eligible for? If so, the FAFSA4caster is for you! If you want to begin exploring your financial aid options and get an early start on the financial aid process, the FAFSA4caster, will provide you and/or your family with an early estimate of eligibility for federal student aid. This website provides you with an opportunity to increase your knowledge of the financial aid process; become familiar with the various types of federal student aid available; and investigate other sources of aid, such as grants and scholarships. Get started today and use the FAFSA4caster now! You can use Federal Student Aid's (FSA) Federal School Code Search Tool to search for colleges you're interested in listing on your FAFSA. You can also find detailed college information, like tuition and fee amounts and graduation rates, and compare that information for up to 10 colleges at a time. If you have more than 10 colleges to compare, you must remove some schools from the Selected Schools table in order to add and compare the additional schools. When applying for financial aid students may come across some financial aid terms and acronyms that they are unfamiliar with. This is common for many first-time and returning college students and parents but, there is no need to worry! Federal Student Aid has an entire glossary to help students and parents understand the various terms and acronyms used in financial aid. Student loans are debt that the student must repay but borrowing them is optional! Students interested in borrowing student loans will need to request a student loan packet from our office either in-person or via email. Have the current year's FAFSA on file at FRC with all outstanding requirements completed. Add FRC using school code: 008597. Submit requirements 2-4 to the Financial Aid Office for processing. What type of student loans are available to borrow? Direct Subsidized Loans are loans made to eligible undergraduate students who demonstrate financial need to help cover the costs of higher education at a college or career school. The U.S. Department of Education pays the interest on this loan: 1) while you’re in school at least half-time, 2) for the first six months after you leave school (referred to as a grace period) and, 3) during a period of deferment. Direct Unsubsidized Loans are loans made to eligible undergraduate students, but in this case, the student does not have to demonstrate financial need to be eligible for the loan. You are responsible for paying the interest during all periods. If you choose not to pay the interest while you are in school and during grace periods and deferment or forbearance periods, your interest will accrue (accumulate) and be capitalized. Direct PLUS Loans are loans made to parents of dependent undergraduate students to help pay for education expenses not covered by other financial aid. The Federal Perkins Loan Program is a school-based loan program for undergraduates and graduate students with exceptional financial need. FRC does not participate in the perkins loan program. FRC is a two-year institution, therefore, students are only eligible to apply for a first-year or a second-year student loan. However, students accepted into our Bachelor's degree program should contact the Financial Aid Office as they may be eligible for additional loan amounts. their amount of financial need. Below is a table you can use to find out how much you can borrow in student loans. The annual amounts shown are for the entire academic year (fall/spring). You will also find a similar table on page 7 in the Direct Loan Entrance Counseling Guide. Want to see what your student loan repayment options are based on your income? If so, use the Repayment Estimator now! $5,500 – No more than $3,500 of this amount may be in subsidized loans. $9,500 – No more than $3,500 of this amount may be in subsidized loans. $6,500 – No more than $4,500 of this amount may be in subsidized loans. $10,500 – No more than $4,500 of this amount may be in subsidized loans. *As defined by the U.S. Department of Education for financial aid purposes. If you qualify as AB540, you may complete the California Dream Act Application (CADAA) in order to apply for California State Aid. Go to https://dream.csac.ca.gov/ to complete your application today! 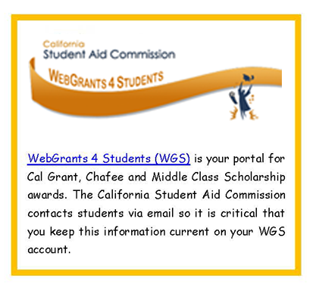 The California Student Aid Commission (CSAC) has the WebGrants 4 Students (WGS) system just for you, the student. The goal is to provide you with the resources, information and tools needed to assist you with the college financial aid process. WGS will allow you to manage your Cal Grant and/or Chafee account(s) online by letting you view updates, make school changes, make address changes, make corrections, and post leave of absence requests. It is important for you to understand that your WGS account does not replace your school or FAFSA accounts. Each account must be monitored and managed independently. Important Note! Starting with the 2017/18 academic year students must create a Web Grants account (https://mygrantinfo.csac.ca.gov/logon.asp) and claim their award. If a student doesn’t claim their award and the school doesn’t either, the student will not show up on the schools roster to award for the applicable award year. Did you know, California Student Aid Commission's FAFSA Text back campaign with Get Schooled lets you get basic FAFSA questions answered? Get Started Now! Text the word "FAFSA" to 335577.